All 32 current year football schedules in one place - get ready for the upcoming season. 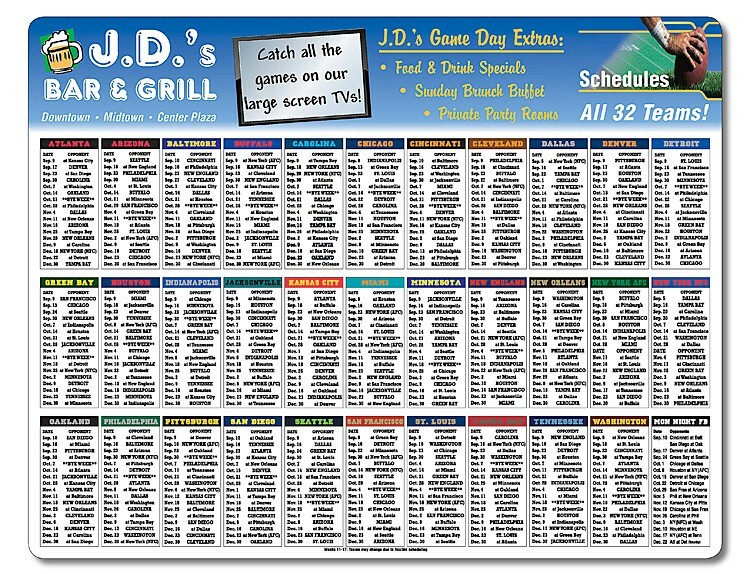 These full-color laminated football schedules feature all 32 pro team schedules in one convenient card. Also available with choice of stock back side imprint and magnets (do not come standard on any order, must specify when ordering). Great for fantasy leagues, game day get together, bars, pubs, out-of-town football team clubs, . . . laminated and sturdy to last all season long. Price includes printing in full-color (four color process) on one or both sides, stock front schedule, and choice of back side imprint . Exact color matches, metallic and fluorescent colors not available in full-color.